Forty-eight-inch rangetops should be easy to buy. These large rangetops differ among brands by their burners, grills, and griddle options. In this article, we will be comparing the 5 best 48-inch rangetops, the differences of having a grill, griddle, or Frenchtop and burners, as well as which professional rangetops are more reliable. Lastly, if you're unfamiliar with the differences between cooktops and rangetops, we also compared the two and why you would buy one over the other. Quite often, the two terms are used interchangeably when they really shouldn't be. The original Jenn-Air Products Company was founded by Louis J. Jenn in Indianapolis, Indiana in 1947, later becoming simply Jenn-Air. In the early years, the company focused on manufacturing and marketing industrial fans for a variety of commercial and industrial applications. In 1961, Jenn-Air's integration of one of these fans to a cooktop range lead to the invention of the first self-ventilated downdraft range. Unfortunately, the brand languished after being purchased by the Maytag Company and the demand for downdrafts dissipated by the 1990s. 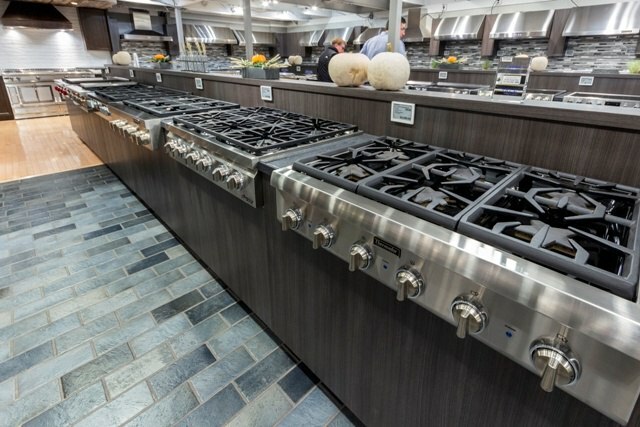 With a 300-million-dollar investment from Whirlpool, specifically in cooking, once again, Jenn-Air is a brand to be considered in the professional range category. This exceptionally versatile Jenn-Air Pro-Style rangetop, with six burners, offers power and precision for different cooking techniques. Two 20,000 BTU stacked burners offer the power for high-heat cooking. A simmer burner offers precise control at a lower temperature, and a high-performance chrome griddle provides even more flexibility. Electric Griddle - This high-performance, 1,320-watt chrome griddle provides even heat distribution for consistent cooking along with its entire surface. 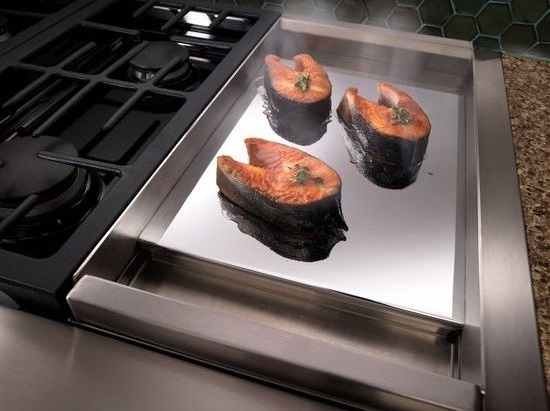 Its durable chrome surface allows for faster cooking at lower temperatures and is by far the easiest to clean. 20,000 BTU Stacked PowerBurner - This luxury rangetop’s powerful burner delivers exceptionally high heat for cooking methods such as flash frying and wok cooking. Miele is the largest family-owned appliance business and based in Germany. They are known for their quality of manufacturing and their reliable products. However, Miele is new to the professional range category as of 2014. This rangetop has decent max output at 19,000 BTU. The grill or griddle is infrared for a faster, more direct heat. Thermador is part of BSH Home Appliances Corporation, a fully owned subsidiary of BSH Bosch. Did you know they are the 3rd largest appliance manufacturer in the world? In 1932, Thermador established its appliance manufacturing as Cranston merged with business owner H.H. Fogwell to form the Thermador Electric Manufacturing Company. Much like Jenn-Air, they languished until being purchased by the Bosch Company in the late 1990s. Thermador prides itself on its industry-leading, extra low simmer at 100 degrees on two of their burners. It is also the only cooktop with a star-shaped burner, which provides a more even heat on the pan (in theory). Their max output is 18,000 BTU, but each burner has that capability. The grill and griddle are electric and slower than the gas infrared. The Sub-Zero Freezer Company was founded in 1945, by Westye F. Bakke in Madison, Wisconsin. For more than 70 years, Wolf has been synonymous with professional cooking equipment for restaurants and hotels. In March of 2000, the company became part of Sub-Zero and was adapted for the serious in-home cook. Adapting to an ever-growing kitchen design segment, Sub-Zero reinvested in Wolf and completely redesigned the line with better simmers, higher outputs, and double convection technology in the ovens. Wolf is good overall rangetop. The three-stage burner can simmer. It has a max output of 20,000 BTU and gas infrared grill and griddle. Stainless steel cover included with griddle, char broiler and French Top. BlueStar is an American manufacturing company based in Pennsylvania. They are the closest to a restaurant range. They have two rangetops. The Platinum has a max output of 25,000 BTU, but with a removable grill/griddle option. The RNB has a 22,000 BTU and built-in gas grill and griddle. BlueStar has the highest output but is an open, not sealed burner. You really have two choices in kitchen design. You can buy a range and have burners, or a cooktop and wall oven combination in one general area. With wall ovens and cooktops, you have the advantage of being spread out if two people like to cook in a household. It can be argued that wall ovens have more features and better controls than ranges. Rangetops are a type of slide-in or drop-in appliance. They are covered on each side by the countertop. Unlike cooktops, rangetops extend through the front of the cabinetry, and the control knobs are positioned on the front of the unit. Knobs on the front add usable space on the top, so typically a 36-inch space will have 6 burners on a rangetop versus 5 on a cooktop. The rangetop will also have the commercial style appearance and more powerful burners than a cooktop along with grill, French top, and griddle options. Lastly, there is a huge difference between rangetops and cooktops in terms of installation as they are installed completely differently. Rangetops are installed on the base cabinet whereas cooktops are dropped into a countertop. Should You Buy a Grill, Griddle, or Frenchtop for Your Pro Rangetop? It all depends on your cooking style. You can sear on a grill especially on the Miele and Wolf infrared. BlueStar has a regular tubular grill. It does not sear like the others, but you can control the gas at a lower temperature. The electric grills heat slower, so the grilling experience is not as good. You need to vent properly with an outside roof blower. Download our grill guide for the right way to vent any appliance. The griddle can cook almost any food, not just pancakes and eggs. Infrared burners are the fastest and usually electric griddles are the easiest to clean. French tops are just one large burner on a griddle, so it is hotter in the middle and cooler around the edges. You can cook items at different temperatures at the same time. Jenn-Air and Thermador will offer similar rebate programs for free dishwashers and hoods or cash back with qualifying purchases only. At times, Sub-Zero and Wolf have a rebate for $1,000 and points for pots and pans or countertop appliances for qualifying products with the purchase of both brands. Make sure to ask about current offers as they do change sporadically. These five rangetops are the best in the game currently. 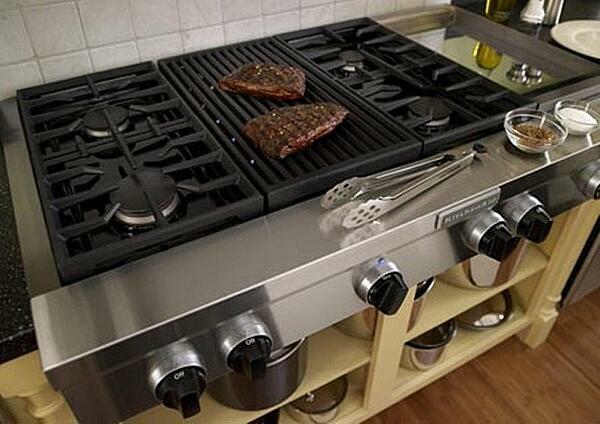 Depending on your cooking needs, one of these should have a configuration that works for you. The most powerful cooktop is BlueStar with BTU outputs up to 25,000 BTU. The burners are open, so you will have to clean underneath. The Wolf grill is the best as the infrared most closely mimics an outdoor grill. Wolf also offers the French top so you have the ability to cook many items at varying temperatures on one surface. Lastly, you can simmer on every burner of a Wolf at a constant temperature of 500 BTU and their burners are powerful at 20,000 BTU. Miele, while relatively new to the market, has a good burner as well as an infrared grill and griddle. The grates are dishwasher safe. But do not underestimate the Thermador and Jenn-Air. The star-shaped burners and extra low simmer on the Thermador rangetop are great for even cooking and delicate sauces. Plus, you have the same high-powered 18,000 BTU burner. The Jenn-Air is great as well, as you get a 20,000 BTU burner (the most powerful of the 4 sealed burners along with Wolf). Jenn-Air has the chromium infused griddle, which is the easiest to clean. Both Thermador and Jenn-Air offer free dishwashers and hoods with other qualifying product purchases. It really depends on whether you like to simmer, need a more powerful burner, grill or griddle. Looking for more information on pro ranges? 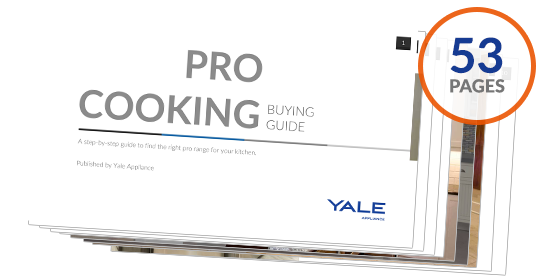 Download the Yale Pro Cooking Buying Guide with specs, features and detailed profiles of all the best brands. Well over 375,000 people have read a Yale Guide.